Aung San Suu Kyi has courageously and selflessly served the cause of democracy and human rights in Burma. And, for this, she has rightly been held up as an international symbol of peaceful resistance against one of the most oppressive and secretive regimes in the World. She is extraordinarily tenacious and remained resolute in the face of cruel intimidation and terrible personal sacrifice. In her decades of house arrest, she showed just how desperate the Junta became about dealing with her – a woman of peace with a just cause but no resources other than the love of her people and international solidarity which grew as the knowledge of her endurance spread. Eventually, she prevailed – and her victory, though not yet complete, has raised the spirits of freedom lovers everywhere. The Labour Party can take pride in our record on Burma and the fact that we stood firm against a regime that was guilty of countless extrajudicial killings, cultural genocide, mass imprisonment and torture of opponents, and savagery against ethnic people. 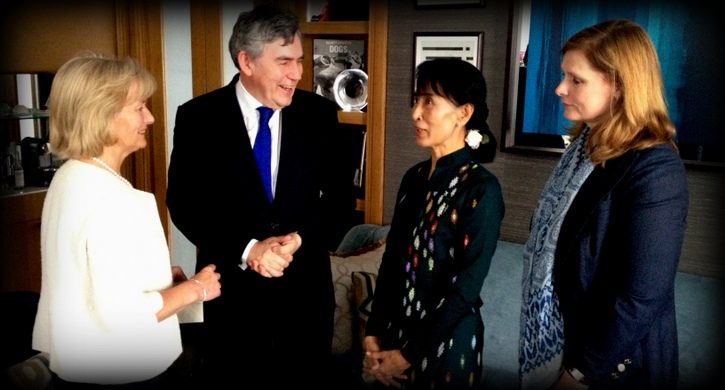 Tony Blair and Gordon Brown never failed to stand by the calls for freedom for Aung San Suu Kyi and the people of Burma and always took a firm and tough line on the need for European sanctions. I know that Aung San Suu Kyi will be glad to talk to Ed Miliband and others who will want suggest ways in which we can potentially work in partnership to support her in a difficult and dangerous time in which the reversal of progress is not impossible. We will also need to pledge that we will press the British Government for substantially increased aid funding for the millions of refugees from Burma who live abject poverty in camps in Thailand. As Aung San Suu Kyi has said, “We must not turn a blind eye to their suffering”. On the day of her release she declared; “My message for all those who are interested in seeing democracy in Burma is that for all of us there are times when we need help – and this is a time for Burma when we need help”. of Burma, a “hand up” out of poverty, and jobs and a future for young people. In spite of all the challenges she shows no bitterness but rather calls for national reconciliation, non violence and dialogue. That must characterise the process of change which Burma is now embarked upon. For me this is a very special time. When I last met Aung San Suu Kyi she was confined to her home in Rangoon surrounded by Government guards. I had travelled to Burma on a tourist visa via Bangkok, having been refused a visa to visit Burma. When I arrived at my hotel, my briefings were conducted in the Ladies toilet with the hand dryer going full blast to protect our conversation from State eavesdroppers. I have never before, or since, had such a sense of the fear felt by people living under such a repressive regime. But later, on my pillow, I found a note simply saying “The Lady” – the name she is given by the people of Burma. It had been left by an anonymous hotel worker and conveyed the power of hope which I frankly found overwhelming. I am naturally an optimist but I never imagined that Daw Aung San would go to Oslo to receive the Nobel Peace Prize – or indeed that she would go there as an elected Parliamentarian.Shortly afterwards, I went to visit her and walked brazenly, without looking left or right, past surprised guards. The time spent with her I will never forget. Her dignity, her strength and her determination to focus on the future of her country and its people was – without exaggeration – spellbinding. It was a privilege and a joy to meet her again and to hear her speak in Westminster. We learnt about what has been achieved but also what needs to be done to gain a truly democratic Government and country after the promised 2015 election in Burma. How will the complex ethnic issues and tensions be addressed? How will the process of constitutional change be managed? How will transparency and accountability of ethical investments be assured? How will what she calls “democracy – friendly growth” be assured? How will justice and the rule of law be installed so that communal violence can be urgently addressed? Aung San Suu Kyi has never looked for an escape, an easy way out. She is sharply aware that there are no “done deals” and that the struggle for justice and equity must and will continue. Our active solidarity will be essential to that. And to guide our efforts we will need to keep in our minds her stern advice to “sustain healthy scepticism, not reckless optimism”.